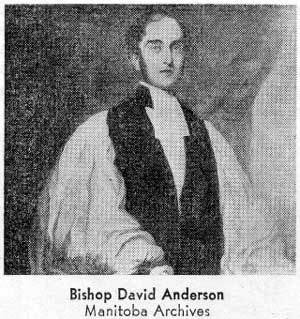 An Excerpt from Bishop David Anderson's book Notes of the Flood at Red River, 1852. April 25: Sunday - The ice having partially broken up, rendered it unsafe to cross the river. A few, however, came over in the morning; more to the afternoon service. Large masses of ice passed during the evening and the following day. The water had risen much, even before the ice gave way, and continued doing so during the week, there being no outlet for it as yet towards the lake: the rise was sometimes a foot, or a foot and a half, in twenty-four hours. The winter had been unusually fine until the end of February; but through the whole of March a great deal of snow had fallen, which seemed sufficiently to account for the present rise. May 2: Sunday - ... The evening was placid and calm, and every breast was still filled with hope. May 3: - These expectations were encouraged by the very slight rise during the night; but from 10 A.M. till 2 P.M. the waters gained so fast as to lead to very painful forebodings. Some houses opposite to us are already abandoned, their inmates tenting on the little knolls behind. We hear of one settler taking a bateau right through his house; another with a boat at his door, ready to carry off his goods: I saw this myself, during my walk, at one house on a low point near us. From the Fort we hear that more than fifty deserted houses may be seen. The owners of some, wholly reckless of the future, and regarding their return to them as uncertain, have in some cases offered them for sale, and some have changed hands in this way for 30s. or £2. The brightest and most unclouded full moon: strange to look upon it, and reflect of how many diversified trials it may have been the witness during its course! How little absent friends know through what we are passing! To ourselves it seems marvellous. Since the melting of the snow, the weather has been remarkably fine, with strong drying winds; so that, with the sky bright overhead, and the ground firm and dry under our feet, the approach of evil in such a form seems almost beyond belief. May 4: - Rode up to the Fort: the sight very distressing. The bridges are all giving way, on which nearly £600 had been expended by the Council last summer. Saw Major Caldwell  and Mr. Black,  and made application to the latter for a boat to remove my family and property, should it be rendered necessary. On starting, I had asked my servant if he wanted anything. He said, "Only powder and shot if we have to go to the Mountain." This showed at once the subject uppermost in the minds of all, and proved that it was now necessary to look the coming evil in the face. May 10: - Another beautiful morning, but the rise in the night greater than any previous one. The water was now in the granary and store, and I was some time standing in the water, which had got into the ice-cellar, endeavouring to rescue some barrels of salted meat, which we had deferred doing on Saturday evening. Through the energy of those around me we succeeded in doing this, though the cold was in-tense. The provision was invaluable to us, as it constituted our summer stock, and main dependence during the warm weather. The loss of the ice, though in our climate a great luxury, and essential for the preservation of all fresh provisions, was, under the circumstances, scarcely felt or thought of. 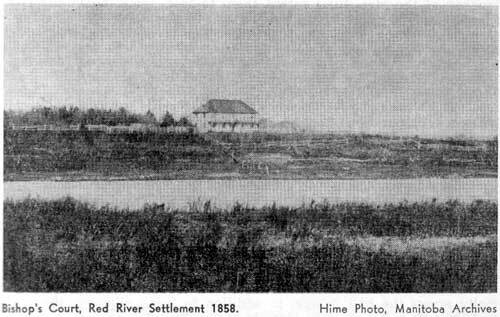 Bishop's Court, Red River Settlement, 1858. Hime photo. This day the boat, which we expected for the little boys, arrived about 11 A.M., with Mr. Black, the officer in charge of the Upper Fort, and Mrs. Black, who kindly came to see us. They were distressed at finding us so surrounded with the waters. Their accounts were most painful. The barn of Emilien, the largest farmer among the Canadians, had floated away: they reported also the loss of many other houses, carried down by the current. A little time was lost in collecting our pigs, poultry, &c., for transportation; and then the boat went off, taking my three dear little boys, and their invaluable nurse, to their spot of refuge on the higher ground of St. James's, to enjoy the kindness and attention of Mr. and Mrs. Taylor. The water gained upon us all day. One of my servants brought tidings from Mr. Taylor of a rise in the Assiniboine of five inches and a half during the night. Another servant I sent down with the horses to the Rapids, to commence the ploughing of the Mission-farm there. A poor Frenchman called on me, begging for a little relief: his house had been swept away, and, besides this, he was left without a bateau: he was houseless, and spoke of his seven children with tears in his eyes, but added, "C'est le bon Die qui afflige" - a lesson of patience to all. The evening was bright and beautiful, the sunset brilliant, and the whole sky without a cloud. Yet vegetation and death how near! All was starting from its long winter, and springing into life, only to be swept over by the deadening tide. The maple-trees, now in full leaf, only served to make the desolation more palpable. There was rich green foliage above, and the waste of waters all beneath. We ascended the high raft of wood, to take a prospect around. How desolate! not a creature visible to the eye, save one neighbour, with his wife, on the top of their raft. Boats, too, were seen in unusual places, still carrying cattle over. On descending from the raft, and walking to the front of the house, I saw from the platform what I thought to be a full sail, beyond the church-yard, on what was the mainland. Those about me laughed at the idea, till I forced them to look again, when the boat sailed round, and approached the house, as a carriage might have done in summer. Wonderful as the look of the river is, more wonderful is the expanse of water towards the plains. The water this evening gained our platform, and washed the walls of the house: whether they may bear the shock is known only to our gracious Father, who guides and checks all by His sovereign will. All necessary preparations had been made during the day, by unhinging and removing the doors of the lower rooms, to allow free current for the waters. The furniture was either carried upstairs, or the heavier articles piled piece upon piece, so as to prevent their knocking about. In doing this, we had to attend to the two houses and school-buildings; and, as all around had now left, it was impossible to get any assistance. My sister and I now took up our quarters in the upper part of one wing of the house. May 26: - Went down to the house in the morning: gratified to find only twenty inches of water, instead of forty, in our rooms. The deposit of mud under the water made our movements more difficult, especially across the hall, where, in addition to being slippery, the floor had started, and now sloped considerably. Found much wood drifted into many of the rooms: in one case, a piece of cord wood had inserted itself into a drawer, which the water had forced open. It seemed like a recurrence of the plagues of Egypt, as the frogs had entered our chambers with the water - no pleasant sight to behold. 1. W. B. Caldwell, Governor of Assiniboia 1848-1855. 2. John Black, Chief Trader, Hudson's Bay Co.